Mike Hardin in front of Hodad’s. All photos by Frank Gormlie. 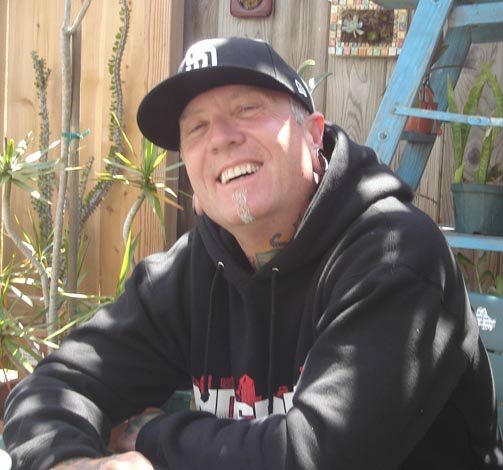 Editor: With the news of Hodad’s Mike Hardin’s death, we had to run our May 2009 interview with him. OCEAN BEACH, CA. It’s readily apparent that at least in one little corner of Ocean Beach, the recession hasn’t really hit – the corner of Newport Ave and Bacon Street, where you see the lines of people waiting to get into Hodad’s – OB’s famous hamburger joint. It’s 12:30 lunch time, and the crowd waits patiently to sit down and chomp into the delicious drippy, beef and bun wonder named by CNN as one of the top five burgers in the nation. Inside, the place was packed, every table filled, every stool taken, every booth claimed, as the staff smartly bustled for hungry mouths. No “OB Time” here at lunch time. This is a typical scene these days. It was a noisy but friendly atmosphere. I spoke to a few people waiting in line outside. One group was from Oklahoma. The older woman had lived in Alpine, and of course had been to Hodad’s in the past. She was bringing her young mid-west friends for their first time – she was excited, they had looks of doubt whether it was all worth it. They haven’t had a Hodads burger yet, obviously. The couple right at the door waiting to enter the building was from North San Diego County. She had seen Hodads on a food network program “Diners, Drive-ins, and Dives” and knew she had to have one. Now she was back and had brought her friend. There’s a million stories like these. The brother of a good buddy of mine goes to Hodad’s every time he flies in from St. Louis. He has to go there at least several times usually during the week he’s here. Hodad’s used to be OB’s secret – the best burger at the beach. There weren’t any lines, but the place was still popular – with it hundreds of license plates on the walls, surfboards hanging from the ceiling, a place that turns beach mementos into pop icons. Then it got famous, and everybody now knows about it. But this isn’t really about Hodad’s – the place, it’s about Mike Hardin – the guy who started it – or at least the guy who made it happen. I met Mike inside the restaurant the other day for our interview. We left, crossed the street and sat down at Jungle Java’s – each with a hot cup. I’ve known Mike since he was a kid flipping patties at his parent’s place – and I wanted to find out if fame had spoiled OB’s most famous burger-maestro. A week ago, I had approached him for the interview. He smiled and gave me a big bear hug, and said sure. He handed me his cell number, and I arranged the meeting. Mike doesn’t have a computer or email, but he does have a cell phone. 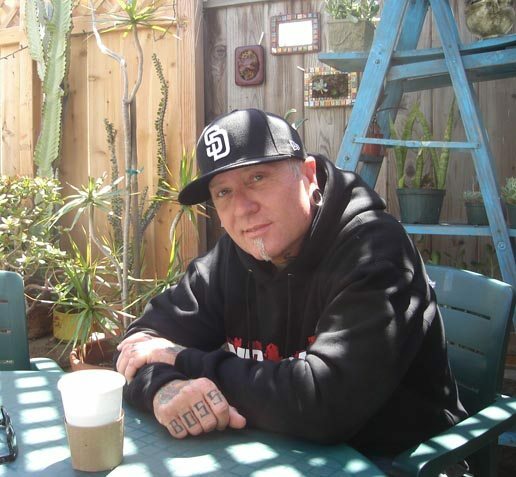 He just turned 50 last Fall, and he’s been in the burger business ever since his parents, Bryon and Virginia, opened up their first joint on Main Street in El Cajon. It was 1969, and their place was called “Hardin’s Barrel”. Mike was 10. Forty years ago. 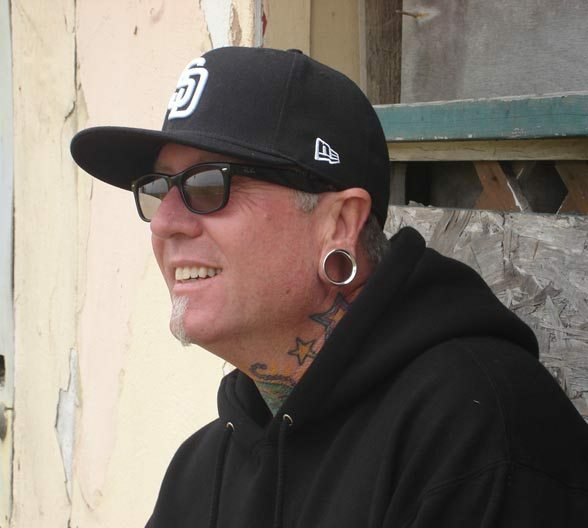 With an affable smile, dressed in black hoodie and hat, wearing dark glasses, he has become a fixture on OB’s main street. We sat down in the back at the outdoor coffee place and talked for nearly an hour. During my entire hour and half with Mike, we were interrupted several times by people coming up to him and saying ‘hi’ and hugging him. Mike is certainly a recognizable guy, with tats on his neck, arms and legs, earrings, with a patch of blond hair below his lower lip. He has “B-O-S-S – M-A-N” emblazoned across his knuckles. 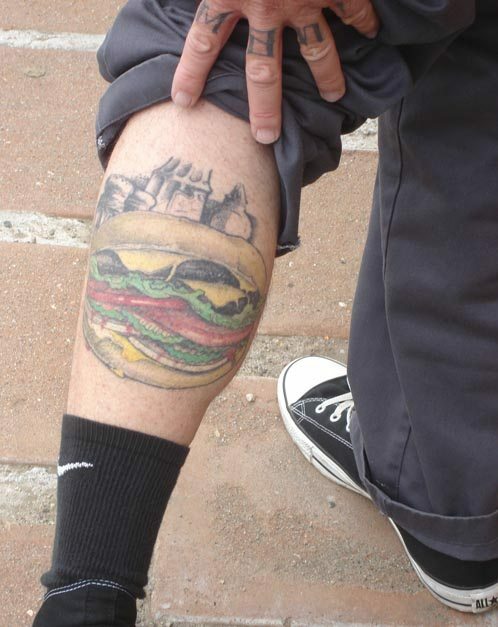 One of his favorites is the burger on his leg. He’s been getting tats since he was 28. Mike appears to be in good shape. “I still box,” he said. He’s been into martial arts for years and works out often at a local gym – he wasn’t bragging, “and you know what, I’ve never been in a fight.” He hasn’t surfed, he admitted, for about 5 years. Born in Louisiana, Mike and his family left the South when he was two years old, moving to California. Once in a while, you’ll hear his drawl – he said he got it growing up with his parents. He told me the whole family – Mike had four siblings – got on the train leaving the South. It was a train moving African-Americans to other parts of the country. Mike said, “We were the only white people on the train. We must have been really poor, because other people were giving us food during the trip.” Bryon and Virginia grew up through the Depression, of course, and Mike to this day, recalls his dad’s frugality. “When we first sold cheeseburgers at the beach, the cheese was probably government cheese,” Mike said through laughter. I remembered Billy B – he used to run a local bike rental shop on Abbott, and used to place ads in the original OB Rag – “Different spokes for different folks,” was his motto. Hodads started in the same building where another restaurant ‘Dempseys at the Beach’ came to be, years later. We walked over there and I took a few shots of Mike right where the old take-out window used to be located. That’s where I first saw Mike back then in the early seventies. Now the site sits empty, waiting for the wrecking crew – 3 story condos are coming in, to be built there where Dempseys was and over that entire half block – bordered by Abbott, the parking lot and Saratoga Avenue. “Mike,” I said, “you know what ‘hodads’ used to mean?” Growing up in the budding surfer world of Southern California in the sixties, I knew the term was a near slur for those who identified with the beach culture, meaning a fake surfer basically. “Sure,” he said, “back then, they were fighting words.” We both laughed at the irony. Mike described how he would flip burgers at the beach site right next to the sand and the little grassy park at the foot of Saratoga, “We used to sell burgers for 25 cents. We had 10 rolled tacos for a buck.” They lived near by in apartments on Saratoga, not far from Abbott. While at the beach the Hardin family went through 3 different owners/ landlords at their little burger joint. Finally, the son of the third landlord, Bushard, saw how successful Hodads had become and he wanted to take it over, so in an effort to force them out, Bushard doubled their rent. That’s when, Mike recounted, they moved to Voltaire. In front of the building where the original Hodad’s started. Curious, I asked him whether his other siblings worked at his parents’ burger places. No, he said, he was the baby, and by time his parents got into the restaurant business, his 2 brothers and 2 sisters had moved on. His family has known tragedy. Both brothers died when they were 49. Phil from a massive heart attack, and Steve – who was permanently disabled – took his own life a couple years later. Mike’s sisters are still living; Dody was 18 when Mike was born so “she was like an aunt to me,” he said. Patricia, the other sister, lives in San Marcos. Her son Brook, Mike said, his nephew, is going into business with him in opening up the second Hodads in Carlsbad later this year. 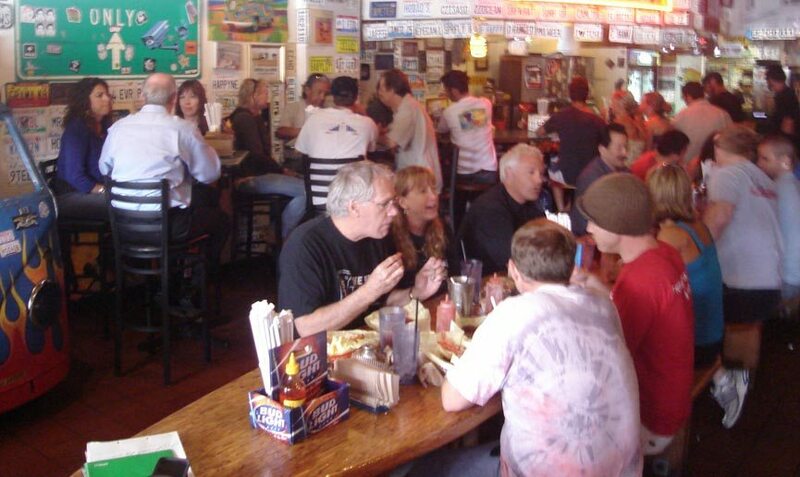 In 1979 Bryon and Virginia moved the business to a site on Voltaire – that’s where Hodads became a real restaurant. “That’s where we made the burger,” Mike said, talking about his famous concoction, that now has made it within the top national five. The place on Voltaire had a “J” shaped counter with stools and a row of booths, in the same old wooden building where Jim Bell has his establishment. “Dad was good about making ends meet, about being efficient.” Mike said. He is a little sad – to think that his parents, Bryon and Virginia, never really “made it” like he has. Back then, back on Voltaire – Mike was starting to learn to surf and was going to Point Loma High School, but he only worked at the restaurant part-time. When he would come in and cook, he would make these giants for his buddies. I remember them, back in the days I ate burgers. You’d go into Hodads for lunch and come out satisfied with the meal, a tad over-priced, but not feeling over-greased, as you might coming out of Boll-Weevil, and definitely still not feeling hungry, as you might coming out of MacDonalds. Byron Harlin died in 1984. Mike then began working full-time at the restaurant, and he and his mom continued to run the place. They had been joined by Terry Rhodes – the later partner – who started in ’82. Mike recounted a significant moment, back there on Voltaire. When he cooked, he used to pile it on. Now, that it was just him and his mom, could he keep doing that, he pondered. So, he decided that he would give himself six months to see what would happen if he continued to make these burgers, big and beefy, lots of onions. Within that six months, Mike found that he had tripled his business. That decided it. This was Hodad’s burger. The place gained some notoriety after an article about them appeared in a local magazine, “San Diego Home and Garden.” “We’d see people from La Jolla drive by, and they’d look, and they’d look. About half would drive off.” Mike laughed. His mom lived another five years and passed away in 1989. Then it was just him and Terry. Mike was 30 and he was running a restaurant. Looking back, Point Loma High didn’t pan out very well for him. Mike never graduated from high school nor did he ever get his GED. “A counselor at Point Loma once told me I wouldn’t amount to much unless I graduated,” he said with a shrug. We both smiled. Now he’s famous. Mike’s been married four times. He’s a bachelor now and likes it. He’s got two kids by his first wife, Robin, Shane 17 1/2 and Lexi 16. He’s still on good terms with Robin for the most part, he said – she lives in OB. Mike thinks his son Shane will join him in the business. But he doesn’t relish his son – or daughter having to go through what he did during his younger days. Mike had a rough time – and appears to have had to drag himself through the decades, with too many experiences and wounds from a hazardous lifestyle. It all caught up with him when he was 30, Mike told me. He laid in a hospital bed with a very dangerous staph infection – he nearly died. When he recovered – he went through a tremendous life change. He became much more appreciative of life. He started studying Buddhism, as a philosophy. “I actually do stop and smell the roses,” Mike explained. “I am the most grateful person.” There was a genuineness in his voice. “You know, Hodads is my livelihood, not my life. If it burned down tomorrow, I would have to live with it.” This summed up where he stood existentially. Hodads move to Newport sounds like it was hell. “It took all of 4 days to open,” Mike said. It was crazy. Mike’s son was 2 weeks old. They went from having 2 employees to 22 overnight. “It was like, if I knew you, ‘hey, can you give us a hand? '” This was in 1991. Mike and Terry have thirty full time people, with another 10 trained to fill in. They pay for all their health insurance, Mike proudly informed me. Most of them are local. That way there’s no feeling of separateness – as exists in most restaurants – between those in the kitchen and those out serving the customers. Waiters know what it’s like in the kitchen, so they don’t get snooty towards the cooks, plus they can predict, for instance, how long a customer’s burger will take, by knowing who’s cooking, etc. Hodad’s beef is delivered fresh everyday. They go through 2500 pounds of hamburger every week. It’s delivered by Seaport Meat Co., as the one-third pound burger is always fresh and never frozen.”Okay,” I said, quickly doing the math, “that’s 7500 burgers a week!” Whew! They also go through 1000 pounds of bacon every week. Mike told me how they make the ‘bacon-patty’: first they’re mixed together, then boiled in water for two hours to get the fat out. Then the strings are grilled into patties. People swear by them. “You get bacon in every bite,” says my girlfriend’s daughter, who loves the bacon-patty burger. Others on our blog staff wanted me to ask about the recipes for their milkshake, as “it’s amazing!” Mike answered back without a blink, “ice cream, milk, and stir.” They also put some whipped cream and a squirt of chocolate to pretty it up. “We don’t make a lot of profit on the shakes,” he said. How did it happen, I finally asked. The CNN fame came from something that happened two years ago. “I got a call one night,” Mike said, “from an employee, who told me some guy named Guy Fieri from the food network channel was at the restaurant.” Fieri was doing a segment of “Diners, Drive-ins and Dives”. They filmed for 18 hours – for a 7 minute clip. This was 2 years ago, Mike says. It was originally aired in August 2008. They played it a lot, Mike added, because of the writers’ strike. It’s still being played. A woman I talked to after the interview outside the restaurant said she’d just seen it. That was the beginning of the fame. The long lines out the door and down the block to the corner. “I’m very grateful,” Mike said. All this hasn’t made him change, he says as we walked over to the old Dempseys, past the Lifeguard station. One of his former wives taught him to just be himself. “‘Mike,’ she said, ‘you’re really good at being yourself, so just be yourself. '” Mike says he’s just being himself. Plus he’s an optimist in life. Mike and Terry and Hodad’s have been giving back to the community for years. Ever since his son Shane was in Little League, Mike has been donating burgers, buns, or giving the League cuts on the meat for their events. They also donate to local schools – the same way – with burgers for the different carnivals. Fame is allowing Mike – and Terry, his manager and his nephew Brook to open a second restaurant. 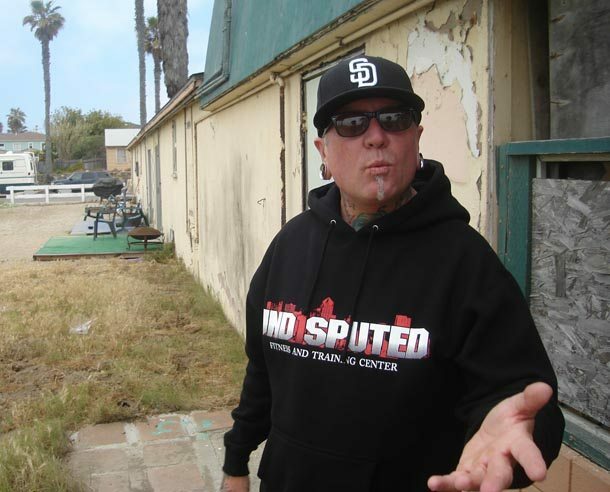 This one, called “Hodad’s Too” will probably open in late July, Mike said, up in Carlsbad. Mike once vowed to me that he would never go ‘franchise.’ And so he hasn’t. The new place will still be his and Terry’s. Mike’s favorite story, or at least one of his more recent favorites, is about a couple who came in and ate their burgers, and then left. But they had flown in from New York City just to try the burgers. And they turned around and flew back. “Nice to have that kind of money,” Mike said. Originally posted May 9, 2009. I was a good friend of Mike’s big brother, Phil. Lots of good memories of him, curly fries and OB. Sorry for the loss. He was cool mofo too!